The global stock market took a plunge as investors jumped out to safer havens —- gold and government bonds — with the situation still looking bleak as the stalemate in Washington entered into its 2nd week. Though traders are jittery, the stock market has remained calm, with many investors confident that the deadlock would end soon. The stalemate resulted to a government shutdown after 17 years, and there are fears that the Treasury Department may not be able to make payments on its U.S. Government debts, if the political battle does not end soon. Nevertheless, the deadlock with no end in sight yet, has thrown the U.S. stock into the pits by experiencing its 10th decline in the last thirteen sessions. The Dow Jones Industrial Average plunged 136.34 points or 0.9% to 14936.24, the lowest level that was reached in a month. The blue chip index funds went down by 4.7% below its level on Sept. 18. In other areas, the financial markets in Europe and Asia also took a beating with the Stoxx Europe 600 plummeting to 0.2% to close at its lowest level in one month, amidst worries for a possible U.S. debt fiasco. The Nikkei Stock Average of Japan was also down by 1.25 after shedding 5% last week. While there was extreme annoyance with the political manoeuvrings in Washington, what are causing the market to be jittery is the possibility that the U.S. might soon hit its debt ceiling, and default. The odds of the U.S. defaulting on its payments are relatively low; but if it happens, the consequences would be spooky. The chief global economist of the Principal Global Investors, Bob Baur, with a $289.1 billion worth of financial instruments, said that he has not made any defensive moves so far. He has been aggressively taking advantage of the market at its lowest points, by buying stocks that he knows will perform well when the economy kick-starts again. The senior portfolio manager of Wells Capital Management, Margie Patel, who manages a $1.5 billion portfolio still looks at the situation on the uppity side, expecting that things will get resolved soon and people will move on. She was candid in saying that market players would want to see a bigger pullback so they can go into buy positions. Though the mess in Washington can be worrisome, big chunks of investors are enjoying the playing field on their investment portfolios. Meanwhile, the S&P 500 stock index sank 14.38 points, or 0.9%, to 1676.12 its lowest since Sept 9. The Nasdaq Composite Index was down 37.38 points, or 1%, to 3770.38. On the other extreme, Gold prices shoot up to 1.2%, at $1,324.80 per troy ounce. The stocks opened lower Monday on the heels of losses in the overseas market ; and a week that showed no indication, that the U.S. Budget stalemate will be resolved soon. 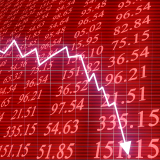 Stock prices stabilized but dropped down to the daily lows later on. Stock market activity was inconsequential as many investors held back on their position to make any major changes. The total composite trading volumes hit the lowest as compared to last Friday, before the Labor Day holiday. The trading volume was the ninth lowest full day for 2013. The market has been fairly stable and is not experiencing massive sellouts. Investors are just waiting out for any opportunities that may come their way. There are more panicky signs in the bond market about the possibility of default by the U.S. The crucial date is Oct .17 where the government will no longer be able to borrow new monies. By the end of the month, the U.S. government faces the risk of a possible technical default on financial instruments —bills and bonds . Expected yield for bills with maturities in late October and early November went up last week as some traders sold their holding position, out of fears of a Treasury debacle. The one month bills maturing end of October dipped again Monday, with yields reaching 0.165%. The three month bill had a yield of 0.025%. Usually, Treasury bills with longer- dated maturities have higher yields as compared to shorter-dated maturities. What has been observed lately is that prices of longer-dated maturities are rising; though yield for the 10-year bills had slipped to 2.634% from 2.650% last Friday, since bond yields move inversely to prices. Treasuries are still considered as a safe haven by most investors, even when the market is volatile. Most market players feel that the situation on the probable non-payment by the Treasury will just be for a short term. In foreign exchange, the dollar fell against the Swiss franc and the Japanese yen, as demand for currencies increased. When markets are volatile, currencies are looked upon as a safe haven by most investors. On one hand, the technology sector rose with Blackberry (BBRY+1.11%) upped by 28 cents or 3.6% to $7.97 after announcements were made that several companies were contemplating a buyout of the Smartphone maker.